Postage charged at cost. If you are ordering jewellery with the card, I will refund you the postage. If you buy several greetings cards, you will get charged at the checkout but I will refund you the difference in postage. Each card measures 108mm x 148mm and comes with a recycled envelope sealed in a corn starch cello bag. Free shipping (large letter)A card and gift in one! 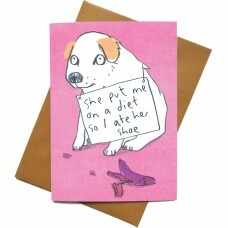 This card has a wearable pin badge as part..
Postage charged at cost. If you are ordering jewellery with the card, I will refund you the po..